Discover Africa and the Middle East by luxury safari vehicle, boat, on foot; by horse, camel or elephant; by luxury train or elegant cruise ship; by air in a hot-air balloon or a privately-chartered plane. Big Five’s luxury African safari tours and luxury Middle East tours offer a stunning array of options to explore the African continent and the Middle East. 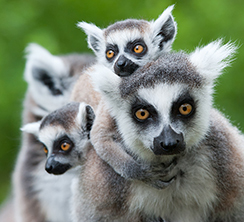 Sail the Nile, track gorillas in the mountains of Rwanda and Uganda; set out on a classic African safari in Kenya and Tanzania; savor a family safari adventure in South Africa. From a round of golf at the Equator, to bungee jumping at Victoria Falls, to a hot air balloon ride over Luxor, whatever your dreams may encompass, you will likely find them among hundreds of the best African safari and exotic tours Africa and the Middle East have to offer. You will be able to have the adventure of a life time, whether you are experiencing one of Big Five’s organized wilderness safaris or traveling on a custom-designed Big Five luxury vacation just for you. The antiquities of Israel and Jordan, the sophisticated shops of Dubai, and the sweeping dessert of Namibia are waiting for you. And, Big Five Tours & Expeditions is dedicated to providing Middle East and African Tour arrangements which offer you the thrill of first-person discovery of the heart Africa, our homeland, and the Middle East. "Southern Ethiopia offers an amazing number of traditional indigenous communities that survive today. We introduce you to the Dimeka women’s market as well as Key Afer, one of the most outstanding market of the Lower Omo Valley tribes. I think you'll find that this phenomenal country is worth exploring before your friends and family beat you to it." I have always been a sucker for classic musicals. Among my top favorites is “Camelot.” One of the definitions for this enchanted name is “a time, place, or atmosphere of idyllic happiness.” I heard about the “Camelot of Africa,” and discovered that it referred to the ancient city of Gondar, known for its medieval castles and churches. The tale is told that in 1636, a buffalo led the Emperor Fasilides to a pool beside the river Angereb, where an old hermit told the emperor he would locate his capital there. Fasilides had the natural pool filled in and built his castle on that very spot. The beautiful castle of stone stands still, and has experienced little damage over these many centuries. Its towers and turrets, walls and balconies echo the romance of that fabled Camelot. Gondar has risen to the top of my travel to-do list. Imagine, a real-life Camelot… sounds simply idyllic. Travel to the magnificent Simien Mountain National Park, a UNESCO World Heritage Site, known for distinctive wildlife including Gelada or bleeding-heart baboon, the lion monkey, the Walia ibex, rock hyrax, and the rarest wolf in the world - Semein wolf, as well as endemic birds such as the thick billed raven, black headed siskin, and white collared pigeon. 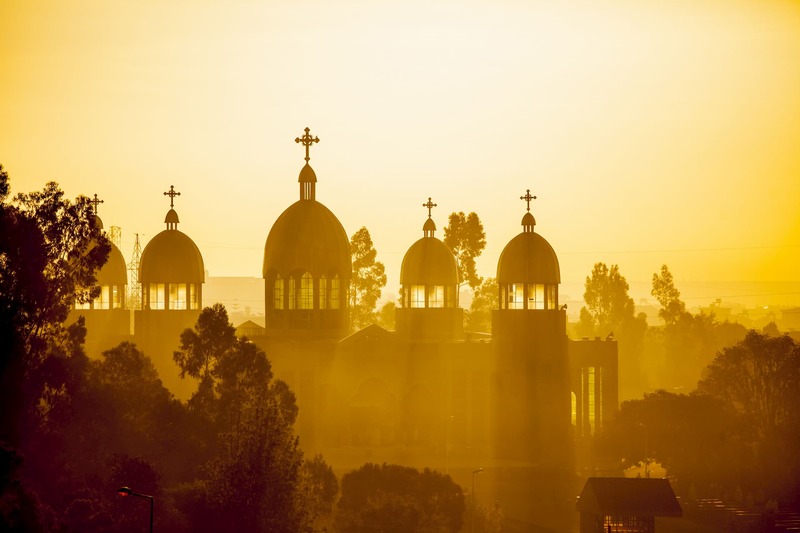 Visit Axum, renowned for its cathedral of St. Mary Zion, where legend has it the original Ark of Covenant is housed; several standing monolithic stelae; and the ruins of Queen of Sheba’s palace. Explore Lalibela, famous for its rock-hewn churches dating from the seventh to 13th centuries; and known as the "New Jerusalem.” Ethiopia is a rare gem on the international stage with enduring culture and singular wildlife and historic sites. Few sights stir my spirit more than a star-filled, open sky at night. 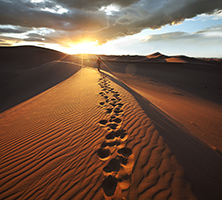 In places like the Namib Desert, you can slip away from lights and find a spot with unrestricted views and settle in. To me, it’s a magic show. I had a slim cot that sat about a foot above the ground that I would take to the end of my dirt driveway with nothing but wild desert across the street. I’d stretch out and watch the night tell her story. Her mood was reflected in the colors – from light purple and mauve to dark blue and then midnight blue-black. I thought the Milky Way was a seam in the universe, stuffed with leftover light, maybe to be used later to create more stars. Often, I fell asleep. My dad came out to check on me, and would carry me back inside. Namibia’s sky is comfortably familiar, different but familiar with altered constellations. But the Milky Way is still there with its overstuffed seam. I half expect to see my dad come to check on me. "I fell in love with Namibia long before I even understood why. What was the connection? Was it the dramatic dunes, the remoteness and remarkable desert animals? Was it the community-based conservancies? Was it that they were the first country in the world to have a sustainability amendment in their constitution? Today, I can tell you that it was and remains all of that. 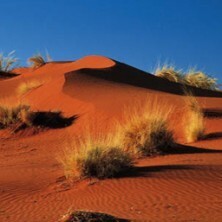 But you need to move beyond the dunes of Sossusvlei." Conservancies are the future of Africa and Botswana and Namibia are on the leading edge of this movement. From the intentional cap on the number of visitors through pricing in Botswana, to the constitutional amendment for sustainability in Namibia, southern Africa is facing a new frontier for remote safaris. The open ranges of northern Namibia, where the real Namibia can be found, to northern Botswana’s Selinda Spillway, where you witness the lesser-known zebra migration, this safari offers you a different view, an authentic experience. Go on safari in the remarkable landscapes of Namibia, from Etosha National Park to Damaraland. 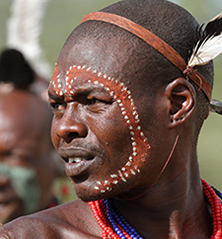 Visit a traditional community of one of the last nomadic people in Africa. Discover the 2,500-year-old prehistoric rock engravings of Twyfelfontein. Namibia offers classic safari experiences in the Namib Desert, Damaraland and Etosha National Park. Discover the dramatic landscapes, unique wildlife and welcoming people of Namibia. Namibia presents the traveler with a wealth of dramatic landscapes and an impressive variety of endemic wildlife. From the fringes of the Skeleton Coast along the Atlantic to the famed Sossusvlei Dunes to the stunning Fish River Canyon to private game reserves, Namibia is a multi-faceted gem offering a remarkable African adventure. Set out on an adventure through Southern Africa's bush for some of the best game viewing -- especially elephant viewing -- in Africa. 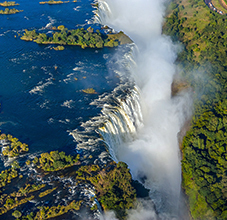 Experience the Zimbabwe side of legendary Victoria Falls by microlight, canoe, bungee jump or on foot. Discover South Africa's exceptional Cape Winelands vineyards. Sample the extraordinary variety of what Southern Africa has to offer. The South Africa I first met had no single face or form, no one posture or personality. I found it in the sweetness of a grape, in the voice of the wind off the cape, in the smile of a young Xhosa girl, and in the deep-throated growl of the leopard. She is big city jazz and tinny tunes from village huts. She was fashioned from the Kalahari’s great, rolling mounds of sand, the random coasts awash with shipwrecks, the lushness of the Cape Floral Kingdom, and, of course, her wild heart. "A few years ago, the question used to be which part of Africa do you choose, East or Southern? Combining the two not was an option. Thanks to new flight routes and the exploration of new adventures, the question now is where do you want to start, Nairobi or Cape Town. It’s the perfect safari for someone that has the time and wants to see as much as possible. Imagine, seeing Cape Town from a WWII motorcycle sidecar, engaging with the San people of Botswana’s Makgadikgadi before exploring the Okavango Delta by mokoro. Take in the awesome power of Victoria Falls, connect with an orphaned elephant at the Sheldrick Orphanage in Nairobi, and cap of the greatest safari with the greatest wildebeest migration in the Serengeti!" 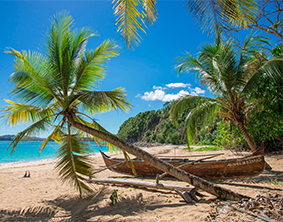 In this Precious Journeys College Edition adventure, you travel with guides who have extensive knowledge of the bush, the animals and the cultures. You walk with the fabled Bushmen of the Kalahari, who share their knowledge and understanding of man's relationship to the environment. There are opportunities throughout this journey to explore what Africa has to teach all of us. Witness a little known zebra migration; and meet rescued, orphaned elephants plus take time to savor a range of activities at dramatic Victoria Falls. Botswana is truly the last frontier, a pristine safari destination, with a mission to protect the pinnacle of sustainable tourism. This adventure goes beyond conventional safaris, introducing state-of-the-art facial recognition software as the means of identifying and tracking animals. This extraordinary Botswana safari takes place in and around the filming locations used by National Geographic’s Dereck and Beverly Joubert. The journey ends in South Africa's Winelands and with a photographic workshop in Cape Town. Go on safari in premier game reserves such as Sabi Sands, featuring wonderful game viewing of the big five and more. Take a leap with a zip lining experience in a previously inaccessible UNESCO World Heritage Site. Savor a private tour of the wine estates of the Cape Winelands. 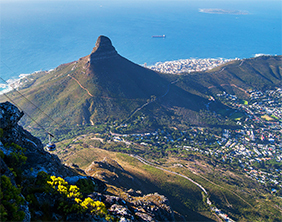 Explore the stunning coast on a private tour of the Cape Peninsula. South Africa offers wealth of adventures.